Has 2012 been a vintage year for the PC? Things have certainly started to hot up with the release of Windows 8 and Microsoft Surface. But epic in the sense of a computing platform going through a major transition. Exactly how successful that transition turns out to be we'll have to wait and see. What is absolutely guaranteed, however, is that by the end of 2013 there will be PCs unlike anything seen before. New form factors. New capabilities. New value propositions. The answer to that question will become increasingly tricky during 2013. Microsoft has released a version of the Windows operating system that's compatible with ARM processors, for instance. So is an ARM-based PC really a PC? Similarly, is an ultra-mobile device powered by an Intel x86 chip but running Google's Android OS a PC? Or does a PC only mean the classic Wintel alliance of Microsoft Windows and Intel x86 processing? It's x86. But it runs Android. Is it a PC? As the lines become increasingly blurred, perhaps it's device types that will matter, not the notion of a PC. While that's playing out, devices that can definitely be called PCs in terms of ye olde Wintel thing will increasingly be available in tablet format. The poster child for full-on PC tablets is obviously Microsoft's Surface Pro, due out early in 2013. On paper, it looks like one device to rule them all. It's a proper x86 PC with an Intel Core i5 processor. It runs the full version of Windows 8 complete with the powerful desktop interface and compatibility with bazillions of legacy applications. Is this the touch-feely future of the PC? 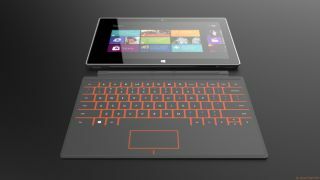 But it's also a tablet device with the Windows Modern touch interface. So, unlike Apple's iPad or any number of Android tablets, it's not an as-well-as device. It's instead-of. Instead of a laptop, that is. So you'll have full touchscreen tablet functionality combined with traditional laptop content creation capability in a single, ultraportable device. Brilliant. The only problem with Surface Pro is pricing. It'll probably cost £800 or more. Mercifully, the world and his dog will be producing tablet convertibles and touch-enabled laptops in 2013. So prices will tumble over the year. It arrived at the end of 2012. But 2013 will be the first full year for Intel's Next Unit of Computing or NUC. Superficially, NUC is just an ultra-compact PC little different from, say, a Mac Mini or any of a number of super slim boxes. But NUC is important in terms of the predictions it makes about the shape of PCs to come. The basics of NUC involve high levels of feature integration, solid state storage and a compact, flexible form factor. Intel's NUC: it's nothing like a Mac MINI, umkay? Most importantly, NUC predicts future PCs powered by SoCs or system-on-a-chip devices. Gone will the the concept of a motherboard into which you plug a CPU and a graphics card. It's all be on ona single chip. Currently, the only problem with NUC is pricing. Even a basic model costs over £400 once configured with an SSD, WiFi and memory. And that makes it look very poor value compared to ultrabooks that offer all that, but also a battery, a screen and, soon, touch capability. The big news from Intel in 2013 will be Haswell. It's Intel's next big CPU redesign and it pretty much lines up with all the other PC related trends for 2013. So it won't be a major step forward in terms raw CPU performance. Instead, it's another step towards that system-on-a-chip end game Intel is aiming for. With that in mind, Haswell's graphics take a big step forward. Hard numbers haven't been released, but performance getting on for double Intel's current processor graphics is probably a realistic expectation, in some applications at least. If so, that will kill the bottom end of the graphics card market stone dead. As for AMD, we were hoping its desperately needed new Steamroller CPU design would rock up in 2013. But that's looking increasingly unlikely. Instead, what 2013 will likely bring will be closure on the basic question of AMD's survival. By the end of next year, we'll very likely know whether AMD can survive in the long haul. If AMD does die, 2013 could see the launch of the very last family of Radeon graphics chips. The fact that NVIDIA probably won't bother to launch a new high end graphics chip in 2013 makes that all the more significant. 2013 could be the year the graphics war is finally won by NVIDIA. Elsewhere in PC hardware, the familiar tale of incremental but relentless technological advance will continue. Peak performance for solid state storage probably won't improve dramatically. But random access will, as will price-per-GB for SSDs, Given that the only really problem with the latest SSDs is pricing, that's good news. It's a similar story for screen technology. 2013 probably won't be a year for revolutionary changes. OLED screens, in other words, are unlikely to go mainstream. But IPS panels should become ever more commonplace now that consumers have been given the hard sell in tablets and phones. Indeed, on the subject of tablet and phone tech finding its way into PC screens, there's also a chance that high DPI panels could begin to pop up in PC monitors. Apple has already stuck a few into its Macbook portables. If it commissions high-DPI panels for a new cinema display, expect that to kick off a broader high-DPI trend for PC monitors. Here's hoping for 4k 30-inch panels and perhaps 2,560 x 1,440 pixel panels in the 22 to 24-inch segments.